A compilation of notes taken by students of knowledge in Shaykh Muhammad ibn Faqih's Science of Hadith class at the Islamic Institute of Orange County (IIOC). Every Wednesday evening after Maghrib prayer. The final exam for the class was Wed May 14th. If you were unable to take the exam the re-take will be Wed May 21st in sha' Allah. Please click on the comment option below and copy/paste your homework assignment #1 (assigned 1/18/08 and due 1/23/08). This hadith is narrated by many unreliable chains. These isnads were deemed to be unreliable because the contain shia, liars and people accused of lying. Albani declared the hadith to be mawdu`. Daraqutni labeled the hadith as mudtarib both in isnad and text. Tirmidhi labeled it as ghareeb and munkar. Bukhari said that hteh hadith has no sahih narration and declared it unacknowlegable. Al-Hakim declared that it is weak. Others who dismissed the hadith are Abu Zur`ah, Abu Hatim, Yahya bin Saeed, etc. Found in al-Manjaniqi collection of narrators. Al-Khatib al-Baghdadi indicated it is a maudu' hadith. The statement is not of the Prophet (saw), but rather a statement of al-Hasan al-Basri. Although, this line appears in many articles, websites, etc, there were no mention of who reported this line as a hadith. It seems that a line developed as an additional statement found relative to weak narrations of other hadith. Further, Ibn Hibban, Ibn al-Jauzi, and al-Albani declared that the line to be maudu (or fabricated). Proven hadith that relative to this topic reads, ““Seeking knowledge is obligatory upon every Muslim,” which was reported by Ibn Maajah in Hadeeth of Anas Ibn Maalik. HADITH #11 (حديث الثقلين): "I have left among you that which if you abide by, you will never go astray: the Book of Allah, and my Family, the Members of my House." Related by al-Tirmidhi, Ahmad, Ibn Abi 'Asim, al-Hakim, al-Tabarani, al-Dailami and al-Tahawi. Hadith #10: “I have left amongst you two things which, if you hold fast to them, you will never stray: the book of Allah, and my Sunnah." This hadith was narrated by Malik. This hadith was collected by al-Hakim. The hadith was declared sahih. Hadith #6: Allah says, "Neither My heaven nor My earth can contain Me, but the heart of My believing slave can contain Me." Al-Ghazali mentioned it in Ihya' 'Ulum al-Din but with different wording. This Hadith is maudu`(fabricated). There is no Isnad from the Prophet Muhammad (pbuh). On the other hand, this hadith is similar to an Israelite Tradition. Hadith #21) "Paradise is under the feet of mothers." Al-Nasai, Ibn Majah and Ahmad. Note) Al-Hakim, Al-Dhahabi and Al-Mundhiri deemed another version of the hadith, in which 'the Garden' is used in place of 'paradise', to be sahih. Hadith #13: "If the iman (faith) of Abu Bakr was weighed against the iman of all the people of the earth, the former would outweigh the latter." Related by Ishaq b. Rahawaih and al-Baihaqi with a sahih isnad as a statement of 'Umar. It is also collected by Ibn 'Adi and al-Dailami from Ibn 'Umar as marfu', but in its isnad is 'Isa b. Abdullah, who is weak. Daif. It is a statement of 'Umar (ra) and is not attributed to the Prophet (saw). The Holy Prophet (صلى الله عليه وسلم) asked him whether his mother was alive. Jahima (رضى الله عنه) replied that she was. “Then keep yourself busy in her service because Paradise lies beneath her feet,” the Holy Prophet (صلى الله عليه وسلم) advised. Hadith #3: " Allah says, ' Neither My heaven nor My earth can contain Me, but the heart of My believing slave can contain Me' "
Al-`Iraqi said in his notes on Al-Ihya'. "I do not find a basis (i.e. isnad) for it", and al-Suyuti agreed with him, following al-Zarkashi. 1. Narrator - There is no narrator for this hadith. 2. Collector - The hadith was not collected. 3. Level of Authenticity - This is not even a hadith. Ibn Taimiyyah said, "It is mentioned in the Israelite traditions, but there is no known isnad from the Prophet (s.a.w) for it." Hadith #18: Hadith about the coming of the Mahdi and the return of Jesus Chrsit son of Mary. Although the Mahdi is not mentioned explicitly in the Sahih colletions of Buhkari or Muslim, there are Sahih ahadith of the Mahdi in other collections. The collectors who have compiled many Hadith of the Signs of the day of judgment were many, some include, Musnad Imam Tirmidhi, Musnad Imam Ahmad, Musnad Imam Abu Ya'la, Musnad Abu Dawud, and many more, manyhave been authentiacted by Sheikh Al Albani, in his Silsilat Sahiha. It should be noted that there are 69 established scholars of Ahlus Sunnah who accepted the idea of the Mahdi and 8 who rejected the idea. Hadith #15: "My Companions are like the stars: whichever of them you follow, you will be guided ." This hadith has an unsound isnad. None. Ibn Hazam states that the isnad is not only unreliablie but the hadith cannot be true for two reasons. 1) the Companions were not infallible, therefore they made mistakes, it would be wrong to say that follwoing any of them leads to guidance 2) the comparison with the stars is wrong, because not every star guides one through every journey. This hadith is da'if or maudu'. Hadith #5 "When Allah completed creation, He wrote in a Book (which is) with Him, above His Throne, 'Verily, My Mercy will prevail over My Wrath.'" This hadith was narrated by Abu Hurayrah. Hadith #3: Allah says, "I was a hidden treasure, and I wished to be known, so I created a creation (mankind), then made Myself known to them, and they recognized me." Narrated by Abdallah Bin Qais. Hadith#24 "Seek Knowledge, even if you have to go to China"
Hadith #8: "Where is Allah (swt)?" Related by Malik, Shafi`i, and Muslim. Found in Al-Muwatta`by Malik,Al-Risalah by Shafi`i, and Sahih by Muslim. Sahih. The Prophet (saws)questioned a captive slave-girl by asking "Where is Allah?" and "Who am I?" For the former she answered: "Above the heaven." For the latter she answered: "You are the Messenger of Allah (swt)." Her first answer is found in the Qur'an: 67:16-17. Meaning that Allah (swt) is above and separate from His creation, not mixed in with it, the erroneous belief which leads to worship of creation. This hadith has many chains of narration on the authority of over a dozen Sahaba (ra), as well as 20 Tabi`een reporting from Anas (ra) alone. Al-Baihaqi regarded the text as mashhur & isnad as da’if, while al-Hakin & Ibn al-Salah regarded it as a mashhur hadith which is not sahih. Later scholars thought that the hadith had enough chains of narration to be considered hasan or sahih. Hadith #5: (Qudsi) "When Allah decreed the Creation He pledged Himself by writing in His Book which is laid down with Him: My mercy prevails over my wrath. 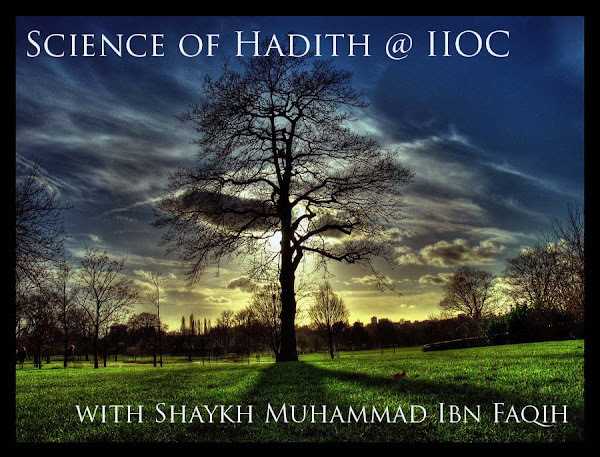 Hadith #9: "Love of one's homelans is part of faith"
Hadith is maudu'. Scholars differ if the meaning is correct or not. Sometimes it is used to justify anti-Islamic nationalism and patriotism. Hadith #16: "The differing amongst my Ummah is a mercy." 1. Narrator of Hadith: None. 2. Collector of Hadith: None. 3. Level of Authenticity: None. There is no isnad for this Hadith. Some say that this Hadith is used as an excuse to either (1) follow people's views blindly without needing any reference to the Qur'an or Sunnah, or (2) to follow the easiest opinion for convenience, also without having to give references from the Qur'an and Sunnah. "Verily, Allah has Ninety-Nine Names which if a person safeguards them, he will enter the Garden." "the differing amongst my ummah ios a mercy"
al-subki said "it is not know to the scholars of hadith"
Hadith #1: "Surah al-Ikhlas is worth a third of the Qur'an." declared by many scholars, including Ibn Taimiyyah, al-Suyuti, and Najm al-Din al-Iskandari. Mutawatir; al-Daraqutni said, "It is the most authentic one regarding the virtues of any surah." Hadith #17: "My Ummah will split up into seventy-three sects: seventy-two will be in the Fire, and one in the Garden." A number of Sahabah have narrated different versions, including Abu Hurayrah (ra), Anas bin Malik (ra), `Awf bin malik (ra), etc. Numerous narrations of this hadith are found in the collections of Abu Dawud, al-Tirmidhi, Ibn Majah, al-Hakim, Ahmad and others. They vary in being sahih, hasan, or da'if, but the hadith is established. Among those who have authenticated this hadith are al-Tirmidhi, al- Hakim, al-Shatibi, Ibn Taimiyyah, Ibn al-Qayyim, al-Dhahabi, Ibn Kathir, Ibn Hajar and al-'Iraqi. Most narrations mention the splitting-up of the Jews and the Christians into seventy-one or seventy-two sects, all being in the Fire except one, prior to mention of the Muslims dividing even more. In some of the narrations, the Prophet (saws) describes the Saved Sect variously as "the Jama'ah (community, congregation, main body)", "the largest body (al-sawad al-a'zam)" and "that which follows what I and my Companions are upon." The hadith does not mean that the majority of Muslims will be in the Hellfire, for most of them ("the masses") are not involved in intentional, divisive innovation; further, mention of the Fire does not necessarily imply that the seventy-two sects will remain there forever, or that those sects are disbelievers. Hadith #26: "We have returned from the lesser Jihad to the greater Jihad (i.e. the struggle against the evil of one's soul)." 1. Narrator of Hadith: Not found. 2. Collector of Hadith: Not found. It does not appear in any of the six collections of the Sahih Sittah. Hadith #26: "We have returned from the lesser jihad to the greater jihad." Ibn Hajar said that it is actually a saying of Ibrahim bin Abi 'Ablah, a Successor. Everyone gets 10/10… I’m so proud of you! Tonight, I shall chastise the others. Hadith #17: "My Ummah will split up into 73 sects: 72 will be in the fire, and 1 in the garden." Abu Dawoon, Al-Tirmidhi, Ahmed, and Al-Hakim all with slightly different endings but similar wordings. Different wordings vary from Sahih, hasan, and daif. Al-tirmidhi, Al-Hakim, Al-shatibi, Ibn Taymiyah, Ibn Al-Qayim, Al-Dhahabi, Ibn Kathir, Ibn Hajar, and others. This hadith does NOT mean that most muslims will be in the hell fire, since most of them (masses) are not involved in intentional divisive innovation, and extreme deviance. Furthermore mention of the fire does not necessarily imply that the 72 sects will remain therein forever or that those sects are disbelievers and out of the fold of Islam. Hadith #7: "He who knows himself, knows his Lord." *Narrator of Hadith: Al-Sam'ani stated that it was quoted by Yahya bin Mu'adh al-Raziwas. *Level of Authenticity: Various answers but majority support or are on the same lines w/ al-Albani who declared that its a false, baseless hadith. Da'if. 1)Narrator – Older narrators reporting from younger ones, on the authority of Hasan al-Basri. 3)Level of Authenticity – Maudu’ – A hadith that can’t be attributed to what the Prohpet (saaws) said.